Trillium -- www.trilliumtheband.com -- is an acoustic folk quartet with a family-friendly eclectic repertoire including traditional Celtic, bluegrass, Americana, ragtime and Gypsy jazz music with an occasional Country tune thrown in just for fun! 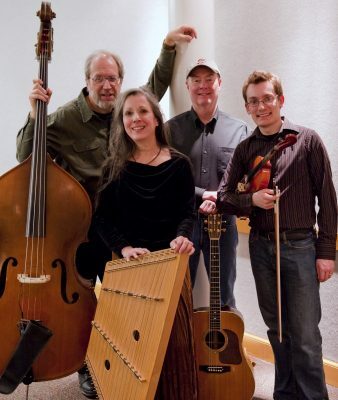 In the 13 years that the group has been together they've performed at over five dozen libraries as well as countless outdoor festivals, coffee houses, pubs, clubs, weddings, retirement homes and much more throughout IL, IN and WI and have released four cds. Instruments are: hammered dulcimer, fiddle, guitar, banjo, upright bass, small percussion, with both female and male lead vocalists.